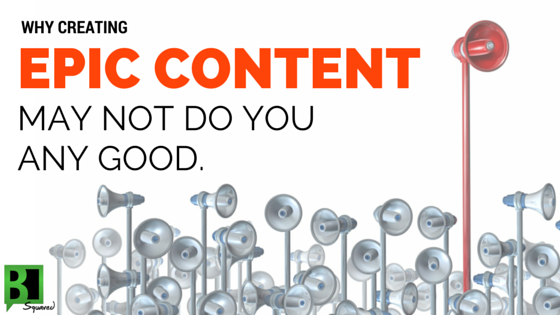 Are you creating epic content? If you are, how do you know? And if you aren’t, why? What does EPIC content even mean anymore?! For me, there are three things I put at the forefront of creating epic content – and guess what, even then they’re only the tippy top of the content marketing iceberg. and on and on? You are not alone. That’s the hard part. First, I want you to banish epic from your vocabulary. Epic is a marketing term. It’s soooooo 2014. Epic is in the eye of the beholder, anyhow, and the only person you need to impress are potential customers. Second, I want you to throw aside your own agenda. That means your brand story, your marketing, your business goals, or your hidden agenda. Last, I want you to focus on the customer you’re trying to snag TODAY. For example, we serve many clients with many needs, but for today I’m focusing on clients who need help with creating epic content. Here’s a little mantra I picked up in one of my networking groups, use it when you’re creating content. My name is [insert name]. I’m with [company name] and we provide [industry or market]. A good referral for me today is someone who … [insert the customer you’re focusing on today]. And you’d know them because they’re saying/looking for/doing [insert your focus customer’s problems, needs, and desires]. Did you catch it? The easy part of creating epic content? It’s not just focusing on your customers, but their problems, needs, and desires. Ah ha. Now we’re getting somewhere. When Alex and I decided to move from NYC to New Jersey it became obvious that I needed a car. In that regard, selling me a car would be easy. As a car salesman, you’d be solving my problem. But the problem with solving problems is that they’re rarely that easy. Knowing your customers’ problems is an excellent start, but using them to dive deeper is much smarter. Using the same scenario, if you’re a car salesman knowing that I need a car isn’t enough. Take it a step further. I need a car, but I want a luxury car. I want to drive a BMW. Since needs and wants drive us to do different things, it’s critical to understand the difference between your customers’ needs and wants. And knowing what someone really wants brings us to the final step. Do I need a BMW? No. I want one. I’m selling the experience of driving a German-made luxury automobile. It’s fast, it’s fun, it’s sporty, it’s good looking, it’s going to make you look like one really cool chick. Desires go beyond the mundane. They play to psychographics. Go back through your most recent copy, whether it’s for your website, emails, blog, or social channels. Fill a need or want? Creating epic content isn’t where it’s at. Creating content that is at the core of what your audience desires is a really good place to start — especially when it comes to converting leads. Take these concepts and apply them to your content marketing strategy and keep them in mind when you’re developing your audience. Have any tricks you’d like to add when it comes to creating copy customers care about? Let us know in the comments section below!